Cannes/Mougins. 80 very special guests were invited to Terra Mater Factual Studios’ annual MIPTV-Dinner on Sunday evening. An impressive preview of production highlights was served: natural history docs with spectacular landscapes and gripping stories, science docs in 4K presented by natural history legend Sir David Attenborough and a wild drama feature film, in which Jean Reno shared the lead role with Mother nature. 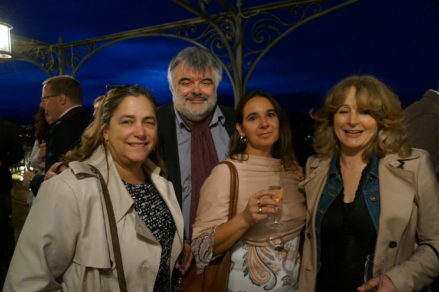 In the hills of Mougins, with a splendid view over Cannes and the Côte d’Azur, CEO of Terra Mater Factual Studios, Walter Köhler and his team, welcomed 80 valued business partners. As well as being served delicious food and drinks, guests were invited to preview a wide range of available programming and future productions. South Dakota’s BADLANDS; a journey through the seasons in one of the most spectacular and unforgiving environments on Earth. TRIBE VERSUS PRIDE, by renowned natural history filmmakers Dereck and Beverly Joubert; a story of hope where age-old traditions are transformed to help the survival of Africa’s most iconic hunter, the lion. And finally, a unique and enthralling natural drama unfolds in THE LIONS RULE. The fates of three powerful lion prides become entwined in this tale of power, betrayal and coming of age. While this year’s MIPTV releases are mostly about nature, TMFS will soon spice things up with a focus on science. Following the trail of last year’s bioluminescent science hit LIGHT ON EARTH, autumn will see the release of ANT MOUNTAIN PRESENTED BY DAVID ATTENBOROUGH. A drama unfolding in the Swiss mountains on a miniature scale: wood ants are the centre of attention in this fabulous 4K documentary, which will be presented by natural history legend Sir David Attenborough. Further mind-blowing science awaits audiences with three more TMFS productions. DANGER FROM BELOW – EUROPE’S SUPERQUAKES takes a look at Europe’s tumultuous past and present. ALL ABOUT THE MOON explores the most recent and spectacular scientific breakthroughs that are shedding light on the Moon’s most enduring mysteries. And SUPERSAPIENS not only delivers an exclusive insight into the fascinating world of artificial intelligence and consciousness-hacking, but gives a first-hand account of how an awakening technology that is already claiming access to our very own bodies! The guests, who kicked off the current MIPTV with TMFS’ Dinner, came from all over the world: the US (PBS, PBS Distribution), Canada (Societé Radio Canada), Korea (Kim Media), Russia (Channel 1), Lithuania (LRT, LNK TV Group), the Ukraine (Intermedia Group, Film UA), Norway (NRK), Sweden (SVT), Spain (Movistar+), Italy (Rai 3 and 5), Germany (WDR, Studio Hamburg, N24, Pro7Sat1TV), Switzerland (SRF), The Netherlands (Area Media), and of course France (France 5, Arte, Canal+). 57 international awards during the last 12 months are an obvious recognition for this work and made TERRA MATER Factual Studios a big winner at international festivals 2016/2017. In the field of feature docs, TMFS’ THE IVORY GAME was an outstanding success. THE IVORY GAME exposed the worldwide illegal trade in ivory and was shortlisted for the Best Documentary Feature at the Academy Awards’ Oscars. It won the ‘Cinema for Peace International Green Award’ for revealing ‘injustices and issues in society, politics or environment’ and it was honoured at the Wildscreen Festival twice: with the Theatrical Award and the Golden Panda – the Oscar of nature films.